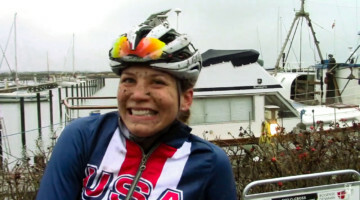 Rebecca Fahringer (Amy D Foundation) had a successful weekend in Rochester, finishing second behind Caroline Mani on Day 2 of the Rochester Cyclocross, after securing an impressive fifth behind Kaitlin Antonneau in Saturday’s Rochester UCI C1 cyclocross race. 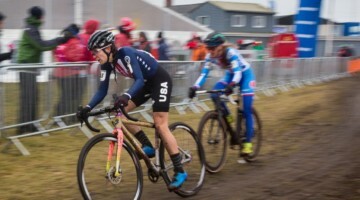 It was a breakthrough weekend for the Amy D Foundation rider, who happened to be racing tubeless tires for the first time as part of the Amy D Foundation partnership with the NoTubes cyclocross program. 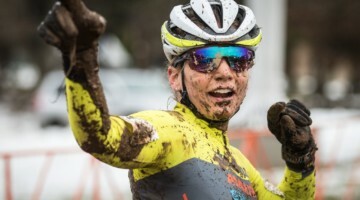 Lee Barber caught up with the second-year Amy D Foundation rider after her second place on Sunday and sent in this quick interview. “So I went to the front of the chase group, and was like, wait, should I be sitting in front of four girls pulling into the wind? I just decided that was the best move for me, and eventually they just kept popping off and I was just sitting in second. See the full interview below, as Fahringer talks tubeless, hydration, slow starts and more. Stay tuned for more interviews. 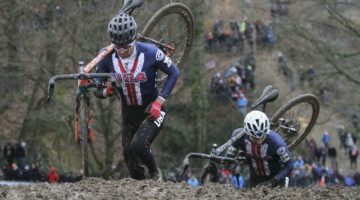 See our interview with Day 1 and Day 2 Elite Men’s winner Jeremy Powers here, and Caroline Mani here.